39 in stock Need More ? 30 cm  p. : chiefly col. ill. Reprint. Originally published: 2004. Split page format. What would happen if Goldilocks had two horrid stepsisters and fell asleep for a hundred years? Would she be woken by a hungry wolf or Little Red Riding Hood's Granny? 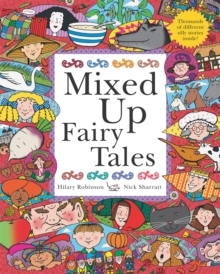 This fantastic split page book allows the reader to mix and match different combinations of fairy tales with hilarious results.